Preface. Electronic excitation in atomic species (J.-P. Connerade, R.C. Karnatak). Simple and complex halides (G. Meyer, M.S. Wickleder). Solid electrolytes (R.V. Kumar, H. Iwahara). Activated thermoluminescent (TL) dosimeters and related radiation detectors (A. Halperin). Analytical separations of the lanthanides: basic chemistry and methods (K.L. Nash, M.P. Jensen). Author index. Subject index. Even at the beginning of the new millenium the rare earths still remain, to a certain extent, a mystery. The chapters in this volume will help to unravel some of these. In the filling of the 4f electronic orbitals the lanthanides defy the elementary aufbau principle that underlies the periodic sequence of the elements, and the authors of the first chapter introduce the readers to the basic physics of the orbital collapse leading to that failure. Furthermore an explanation is offered in terms of double-well potentials. The phenomenon is illustrated using the valence transitions observed in some of the rare earth atoms, including Sm group metals and the higher oxides of cerium, praseodymium and terbium. 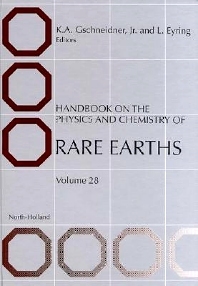 In the second chapter the synthesis and structure of the many types of rare earth halides are described. They have been described as simple, complex, binary, ternary and multinuclear complex, and other categories needed to deal with the most studied of the rare earth compounds. The structure types are skillfully illustrated to show the elementary architecture of each type. In chapter three the authors discuss the science and applications of rare earth super ionic conductors as solid electrolytes. Conduction by oxygen and fluorine anions as well as hydrogen and other cations associated with these electrolytes is emphasized. They deal with extrinsic and intrinsic types together with their associated structures and structural types including structural defects. The chapter concludes with an outline of the many applications of solid electrolytes. Chapter four introduces the reader to the principles that underlie thermoluminescence and its application to dosimetry and provides detailed information on the R-activated phosphors that support dosimetry. This is a selective review of detailed literature based on the areas making most progress. The final chapter elaborates on the data gained by the studies and interpretation around the analytical separation of the individual rare earth elements utilizing chromatographic techniques. The authors describe the fundamental chemistry that underpins contemporary analytical separation techniques for lanthanide separation and analysis. This is done after a description of the rich assortment of separation methods in use has been introduced.